I often refused to go for sunday brunch in Boston. I was addicted to a 10am step-class, followed by weight training class. Two hours of exercise rather than calorie-intake. Boston in the 90s. My student days. 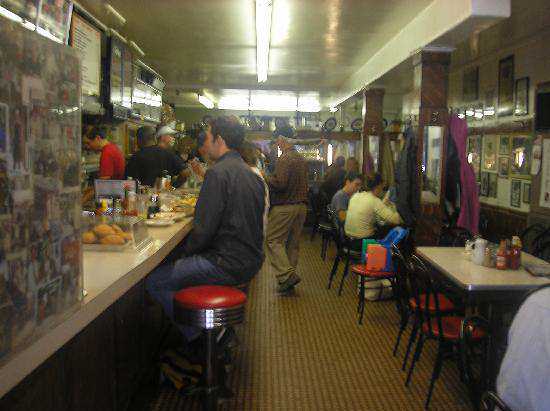 However, breakfast out could happen any day of the week in graduate and especially post graduate school, because the classes were spread out freely. 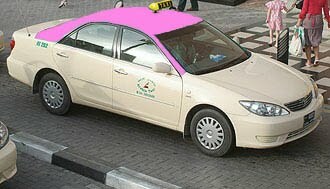 I could squeeze 5 friends in my German sedan. Or visiting relatives, or my cousin, dental student at Harvard. Always my boyfriend, turned husband. We soon realized that we were both early birds and breakfast afecionados, a common point that brought us closer. He loved Charlie's Diner on Columbus Avenue. 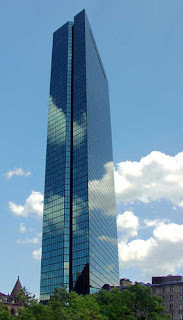 I had read about it in Boston Magazine and we had discovered tucked behind Copley Plaza and the stunning I.M.Pei glass high rise. I have taken innumerable photos of that building from the vantage point of Charlie's Dinner. We often dodged long serpentine queues on weekends, unless I took my Villanova brothers, visiting from Philadelphia or my sister visiting from Stanford. We went on weekdays, sat at the laminated bar, or the formica tables. This is not a well lit neo-dinner a la Johnny Rockets. This is an authentic unpretentious Boston dinner, dark and gloomy, where your eyes adapt to the ambiance. Men at work, cops, hospital employees and students sit at tables, still wearing their winter hats and coats, drinking out of chipped mugs and devouring eggs, fritters, french toast and pancakes piled high, dripping in generic syrup. My future husband always ordered turkey hashbrown! 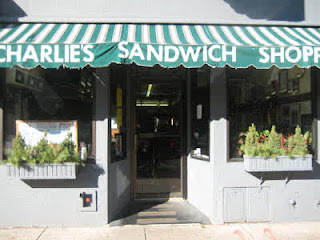 The other breakfast place, a short distance away, in the residential part of SouthEnd Boston, was miles away an experience from the dingy Charlie's Dinner. ToGo's served a more alternative, hip crowd. No cops or students (except for us) here: scones, pastries, muffins: all the American array of pastries, with a dash of the best ingredients, the most gourmet flavors. People here sat leisurely sipping cappucinos, over the New Yorker magazine, caressing the dogs they walked, joking about their party hangovers. Fashionable tatoos, tasteful piercings, bulging biceps, Martha Vineyard Black Dog tshirts informing the rest where they spend their long weekends. Memories of Boston often are made of these breakfast moments. The blogger introduced me to American college life when I was in high school and would visit her in Boston during midterm holidays. She got me prepared for collegiate life both academically and socially. She always put her whole heart into it like in anything she does. I fondly remember Boston because of her. Experiencing college in the US is an experience like no other which cannot be replicated outside the US. A big thank you to the blogger! A Film or a Gem? Do you Ride a Camel to School?